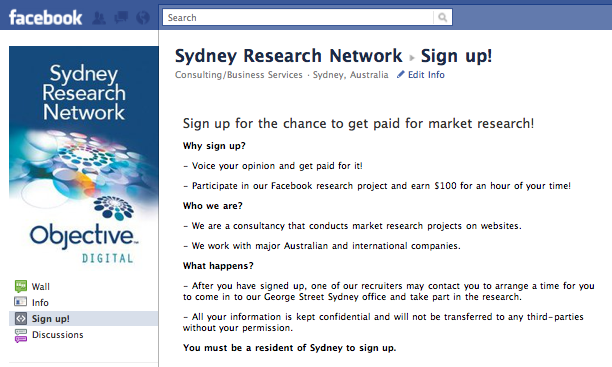 We are pleased to announce our new Sydney Research Network on Facebook. If you or anyone you know would like to be participants in our face-to-face user research and usability testing sessions in George St, Sydney then sign up. You can earn up to $100 in an hour! And don’t forget to like our new page (right below) please. This entry was posted in Uncategorized and tagged market research, Sydney Research Network, usability testing, usability testing sydney by Objective Experience. Bookmark the permalink.